U.S. stocks could face another rocky session, as investors await the latest discussions on how to solve Europe's debt crisis. Dow Jones industrial average, S&P 500 and Nasdaq futures were all slightly lower. Stock futures indicate the possible direction of the markets when they open at 9:30 a.m. ET. Attention will remain focused on Europe as the Spanish banking system teeters on the edge of collapse, and Greece comes closer to a possible exit from the euro. 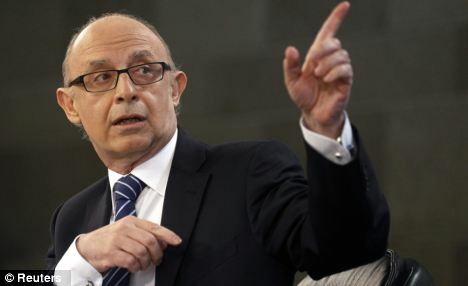 Spain's Treasury Minister Cristobal Montoro told a Spanish radio network early Tuesday that the country was nearly shut out of global finance markets, and that its banking system would need help from other European countries. Yields on Spain's 10-year bond crept slightly higher to 6.4%. Credit rating agency Standard & Poor's said Monday that there is a one-in-three chance Greece will leave the euro currency union in the coming months. Finance officials of the world's seven largest economies, the G-7, are reportedly holding an emergency call Tuesday to discuss the crisis. In the United States, economic data on tap includes the Institute for Supply Management's services index. But even positive news could be drowned out by other concerns, said David Kelly, chief global strategist for JPMorgan Funds. "There is a general gloom that has enveloped markets," Kelly said. "The markets are more focused on Spain right now, but the greatest threat to eurozone is in the hands of the Greek voters. 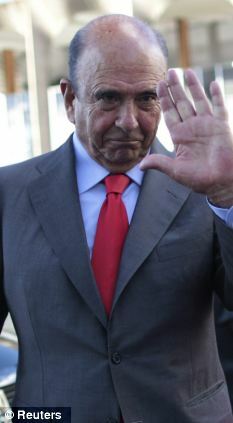 Until we get some clarity from (the June 17) Greek elections, we won't know what's going to happen." Kelly said that he believes stocks have become oversold, as investors have moved out of riskier assets such as equities and into U.S. Treasuries in the last month. He said that stock values relative to bonds are at their cheapest point in the last 50 years. The price on the benchmark 10-year U.S. Treasury was little changed Tuesday morning, leaving the yield near its 1.53% level late Monday. CNNMoney's Fear & Greed Index remained in extreme fear territory Tuesday. U.S. stocks finished little changed after a choppy trading session Monday. World markets: European stocks were mixed in afternoon trading. The DAX in Germany slid 0.8%, while France's CAC 40 edged up 0.7%. London's stock market is closed Tuesday in celebration of the Queen's Diamond Jubilee. Asian markets ended on a higher note. The Shanghai Composite ended up about 0.2%, while the Hang Seng in Hong Kong added 0.4% and Japan's Nikkei rose 1%. Economy: The ISM's services index for May is due out at 10 a.m. ET. Economists surveyed by Briefing.com expect the index to fall slightly to 53.1 from April's 53.5. But any reading above 50 still indicated growth in the service sector, which makes up the majority of the U.S. economy. Companies: Starbucks announced plans to buy a bakery chain after the market closed Monday. Preliminary news of an impending business initiative sent shares higher at the close, but the acquisition itself was not enough to keep investors' interest. Shares fell 2.2% in premarket trading. Facebook shares continue their slide early Tuesday, losing another 1% in premarket trading after a 3% drop on Monday. Reports Monday that Facebook is looking at ways to allow children younger than 13 to use the site is prompting new criticism of the social networking company. Currencies and commodities: The dollar rose against the euro and British pound, but fell versus the Japanese yen. Oil for July delivery slid 25 cents to $83.73 a barrel. Gold futures for August delivery rose $5.80 to $1,619.70 an ounce. NEW YORK, June 5 (Reuters) - LPL Financial, the largest U.S. independent brokerage, on Tuesday said Dan Arnold, its head of strategy, would take over as chief financial officer effective June 15. Arnold, 47, will succeed Robert Moore, whom LPL on May 1 named as its president and chief operating officer. Moore, who is 50, will transfer his CFO responsibilities to Arnold over three months. Arnold will be based in San Diego. Before leading corporate strategy in October, Arnold had served as president of Institution Services, which Boston-based LPL acquired about five years ago to provide third-party investment and insurance services to banks and credit unions. Moore, in an interview, said Arnold was chosen over "dozens" of external and internal candidates in a search process that began in January. The transition follows a busy period for LPL Investment Holdings Inc, which was acquired by private equity firms TPG Capital and Hellman & Friedman in 2005 and went public in a late 2010 initial public offering. In recent months LPL announced a special dividend, plans to pay a regular dividend and secondary stock sales that trimmed the stakes held by the private equity owners. LPL also refinanced its debts. Stocks were wavering Tuesday as traders struggled with the outcome of emergency talks among the Group of Seven industrialized nations to tackle a deepening euro zone crisis. A Japanese source said no statement would follow the G7 conference call, and Japan's Finance Minister said he told G7 members that Japan is confident in Europe's response to its problems. "It has come to a point where the market needs to see some concrete plans," said Rick Meckler, president of investment firm LibertyView Capital Management in New York. "They took comfort in leaders getting together and talking in past times. This time they need to see something definitive to begin to resolve this crisis," Meckler said. Adding to recent bearish sentiment, all of the euro zone's major economies are now in various states of decline, according to business surveys that suggested even Germany is no longer immune to the crisis. The S&P 500 was flat for the day on Monday, after a steep decline last week, as investors weighed low prices against the backdrop of Europe struggling with debt and stalling economies. Debt prices rose in Germany while Spanish bond yields briefly jumped after Spain's treasury minister said the country was effectively shut out of credit markets. Spain's two-year yields briefly rose above 5 percent for a fifth straight session while the 10-year held steady near 6.3 percent. Market participants see the data affecting equities only if the numbers are far off expectations. Facebook shares turned slightly higher in premarket trading after reaching a low of $26.44 on Monday. Four out of five Facebook users have never bought a product or service as a result of advertising or comments on the social network site, a Reuters/Ipsos poll showed.